You know how manufacturers like to show how easy their product works by saying "it's so simple even a baby can use it"? Sometimes, having a product that a baby can access is not a good idea. Take the eBay app for example. It is so simple to run that 14 month old Sorella Stoute used it to accidentally purchase a 1962 Austin Healey for her dad. Luckily for her parents, the car cost only $225. 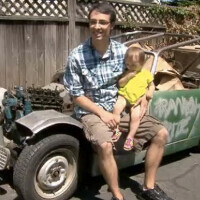 As Sorella's dad put it during an interview with KOIN, "She decided to open the eBay app and started clicking around and one thing led to another and we own a car." Instead of trying to explain to eBay what happened , Mr. and Mrs. Stoute decided to keep the car, although they did have a small panic first. To prevent the toddler from moving to the luxury priced models, Dad has added some safeguards to keep his precocious daughter from opening up the apps on his phone. He is now using facial recognition to keep his phone locked, and has switched to a new PIN code. His parting words? "I’m just glad she didn’t buy the $38,000 Porsche I was looking at," he said. "one thing led to another and we own a car"... fishy... did the toddler enter payment details as well??? No, she bought it, but then he decided to pay for it later on when he saw that it was not so expensive. In ebay, you can but an item but you do not have to pay immediately. You can pay later after a purchase, and you cant cancel a purchase in eBay. Yes, you can cancel a purchase in ebay if you haven't paid for it yet. In fact, sometimes it's even possible to cancel a purchase and get a refund after you have paid for it (before it's shipped). Just email the seller and ask nicely. If it's not an expensive item, they do it. Yes, the toddler checked out with PayPal and even added a Message to Seller: "People are so stupid that, they'll believe a middle-aged man whose going through a mid-life crisis and who is obviously SCREAMING, like a latent flame, for media attention when he alleges that I bought this piece of junk. Truth is, my dad was in one of his drunken stupors and thought he was opening the iMessage app on his iPhone; no wonder it wasn't working for him. Please send the car via U.S.P.S. so that someone at the Post Office is forced to work. Thank you, Baby X"
Looks like she won't be getting any fancy car on her 18th birthday. Good for the parents for taking the responsibility! Story seems made up to me. a 14month old randomly clicks ebay app then randomly searches "piece of crap cars for cheap" then buys it... Hmmmm.. This is one of those funny stories that is teaching us important lessons, in this case: don't allow your toddler to go shopping online, you don't know what you may end up with. He might as well start looking for auto parts and restore the car!